Most of our offices at work are on the second floor of a building. The building is very open, with an atrium and a skylight above. The staircase runs up through the atrium and they are surrounded by a wooden rail. 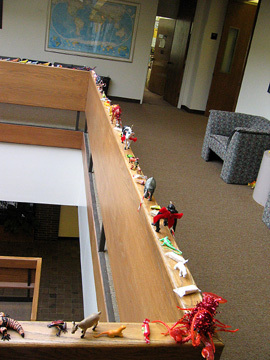 For each of the past four Decembers I've decorated the railing with plastic animals and asian candy. View along the north railing. Note stegosaurus on floor. 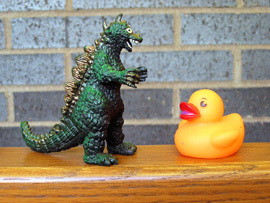 Imitation Godzilla vs. rubber ducky. I try to vary the display from year-to-year. 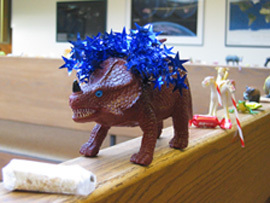 This year I wrapped some animals in glittery garland and, unlike past years, there are no insects in the display. 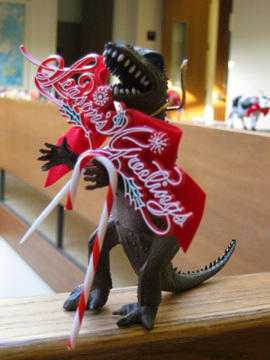 The first time I decorated I used almost all the plastic animals. Now, only a small fraction are displayed. There's another side railing and two side tables that also have animals and candy. My friend Greg and I did some shopping around town yesterday. I got these candies at the Aji Ichiban shop on Mott St. in Chinatown. 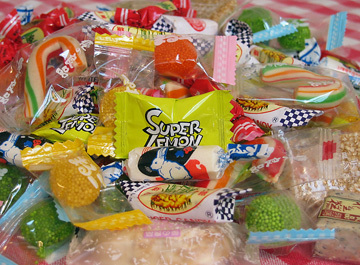 They carry all sorts of hard and chewy candies, as well as flavored dried fruits, olives, and fish. What I also like about Aji Ichiban is that most of their candy is sold as bulk, so I can pick and choose various flavors. Yesterday I picked out chewy ginger and milk candies, peanut candies, sesame bars, orange, lemon, and watermelon gummies, coconut chewies, and tiny candy canes. close-up of candy packages courtesy of rachelleb.com. Japanese candy packages from Jason Zada. More candy photos, and perhaps an answer to this site's enigmatic name, tomorrow night. Duane Reade is big local drugstore chain. 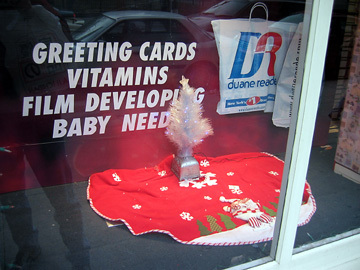 This was one of the window displays at their Broadway and Chambers Street store. The other window displays were equally pathetic. Why bother decorating? C'mon Duane Reade you can do better than that. 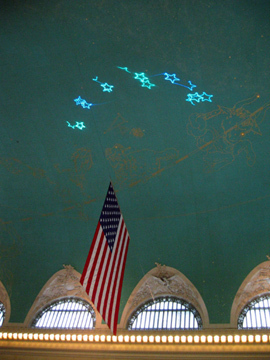 Grand Central Terminal has laser light shows on its ceiling during the holiday season. There are seven different shows, of about five minutes each, that take place every half-hour during the day. 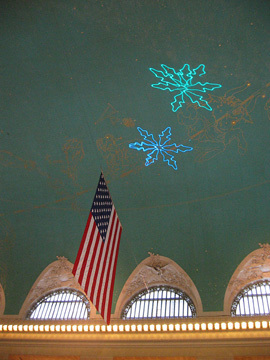 The shows provide a break from holiday shopping and you get to stare at that beautiful ceiling for a few minutes. There's a holiday fair in Vanderbilt Hall. I wasn't impressed with this year's offerings and recommend the fair at Union Square instead. 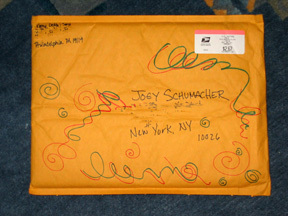 My friend Romy, and her cats Delta and Seryi have sent me a package. Do I open it now or wait for Christmas? It is not marked "Do not open 'til Christmas" so I think it is a pre-Christmas package that will soon be followed by a Christmas gift! In that case I should open it now. 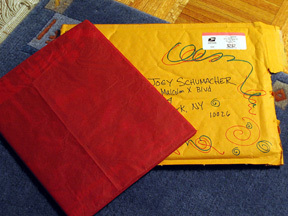 Then again, the cats did a nice job of decorating the envelope in Christmas colors, so maybe it is a Christmas present. That would argue for waiting two weeks before opening. What to do, dear reader, what to do? While you think about this I am going back to sleep on the couch. It is wrapped, so it might be a Christmas gift. Then again, there is no Christmas card, leading me to think this is just a random gift out of the kindness of Romy's heart, and that a lovely, larger Christmas, with card, will soon appear. I have it on good authority that she will soon make an appearance on these pages to set the record straight. I've been slowly coming down with something the last day or so. I came home early and just woke up from a two-hour nap. No slide shows about manhole covers for me tonight. Darn. Diana Stuart, author of "Beauty Underfoot: The Art of Manhole Covers" is giving a slide show lecture at the Tompkins Square Branch of the New York Public Library tomorrow night at 6:30. 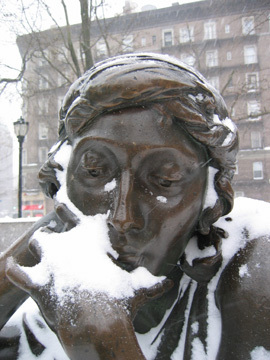 Close-up of "Memory" by Augustus Lukeman, Straus Park (106th and Broadway). The model for this sculpture, and many others of the period, was a woman named Audrey Munson. Munson and I share the same hometown. She was once well-known, but is virtually forgotten today. I've been taking photographs of statues for which she modeled and will be posting them on my Audrey Munson site. 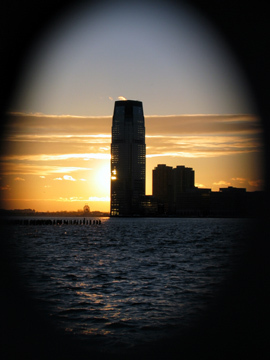 I caught this sunset while walking along the Hudson River Park this afternoon. The framing isn't a photoshop trick. The railing along the river had metal plates spaced every few feet and the plates had holes at their corners. I shot the photo through one of the holes. 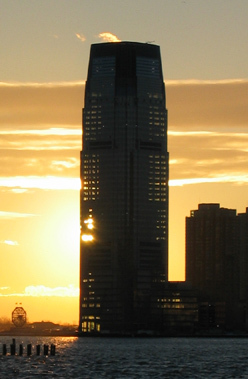 The building is New Jersey's tallest. I think it is owned by Merrill Lynch. The octagonal shape to the left is the Colgate Clock, the world's largest, according to Ms. Komorowski's class at PS 27.